The Massachusetts Department of Public Health (DPH) announced today that the risk for eastern equine encephalitis (EEE) in people has increased in a large part of southeastern Massachusetts, including Bridgewater. Due to EEE positive mosquito samples and the death of a horse from EEE in Middleborough, Lakeville and Middleborough were already considered to be at high risk for human disease. Today, the high risk area is being expanded to include the towns of Acushnet, Berkley, Bridgewater, Carver, Duxbury, Fairhaven, Freetown Halifax, Kingston, Mattapoisett, New Bedford, Plympton, Raynham, Rochester and Taunton. The towns immediately surrounding that area are at moderate risk. EEE is a rare but serious illness spread by the bite of an infected mosquito. While EEE can infect people of all ages, people under 15 years of age or over 50 years of age are at greatest risk for serious illness. · Be Aware of Peak Mosquito Hours - The hours from dusk to dawn are peak biting times for many mosquitoes. Consider rescheduling outdoor activities that occur during evening or early morning. Otherwise, take extra care to use repellent and protective clothing. · Clothing Can Help reduce mosquito bites. Although it may be difficult to do when it’s hot, wearing long-sleeves, long pants and socks when outdoors will help keep mosquitoes away from your skin. · Drain Standing Water - Mosquitoes lay their eggs in standing water. Limit the number of places around your home for mosquitoes to breed by either draining or getting rid of items that hold water. Check rain gutters and drains. Empty any unused flowerpots and wading pools, and change water in birdbaths frequently. While Bridgewater continues to work closely with the MDPH and other agencies, locally we are actively notifying all citizens through public relations efforts utilizing local cable, newspapers and the Plymouth County Sheriff’s Department public information system. Fact sheets on EEE and on reducing exposure to mosquitoes are available at www.bridgewaterma.org. In addition, the Town plans to undertake larviciding efforts. Information about EEE and reports of EEE virus activity in Massachusetts during 2010 can be found on the MDPH website at www.mass.gov/dph under A for arbovirus in the Health Topics A to Z index. Recorded information about EEE is also available by calling the MDPH Public Health Information Line at 1-866-MASS-WNV (1-866-627-7968). The Bridgewater Community Emergency Response Training (BCERT) is recruiting Bridgewater residents for our next Training Session starting in September. BCERT Informational Session: Monday, September 20th at 7:00 pm in the Community Room, located in the lower level in the Bridgewater Police Department. Parking and entrance to the Community Room is at the rear of the Police Station only. BCERT Training Classes start on Monday, September 27th from 6:30 pm - 9:00 pm and each Monday thereafter - all classes are in the BPD Community Room. The Bridgewater Community Emergency Response Team (CERT), as part of Bridgewater;s Emergency Management Department, is recruiting community based volunteers who can serve during local or regional emergencies and/or assist with public health and safety needs during the year. CERT training teaches you to prepare yourself, your neighbors and your community to be ready in the event of an emergency and to act on that training if the need arises. Because emergency services personnel will not be able to help everyone immediately in a natural or man-made disaster, you can make a difference by using the training to save lives and protect property. We're encouraging residents to email BridgewaterCERT@gmail.com with their name and contact info to inform us of their interest in attending the Info Session on 9/20 in order for us to have an idea of how many people to expect. Bridgewater State College will be hosting a Good Neighbors Day on August 30, 2010. For more information about the day and to sign up, please click here. The Children's Room at the Bridgewater Public Library will offer a Go Green Story Hour and Craft Activity on Wednesday, July 28th at 10:45 AM for children ages 3-8. Registration is required and you can call the library at 508-697-3331 to register. This program is sponsored by the "Warm Cookies and Milk" class from Bridgewater State College's PCC (Project Contemporary Competitiveness) program. There is currently a water restriction in Bridgewater. Please click the link below for more information. You are cordially invited to a follow-up meeting of Bridgewater 2020: Focusing on Solutions to be held on Tuesday, July 27th from 9:30am – 12:00 noon at the Dunn Conference Suite in Crimson Hall at Bridgewater State College. Registration will begin at 9:30am coffee and snacks will be served. Please come prepared with ideas to support these broad themes or suggest other themes. This Friday evening, join Diehl Art Gallery from 7-10pm for the Featured Artist Exhibit: Eli Helman. Come and see his amazing "maximalist" pen and ink drawings and enjoy free food and wine! Bring family and friends as it will be a great evening. RSVP with the link below! See you this Friday Night at Diehl Art Gallery! We'd like to welcome Diehl Art Gallery as the newest addition to downtown Bridgewater! 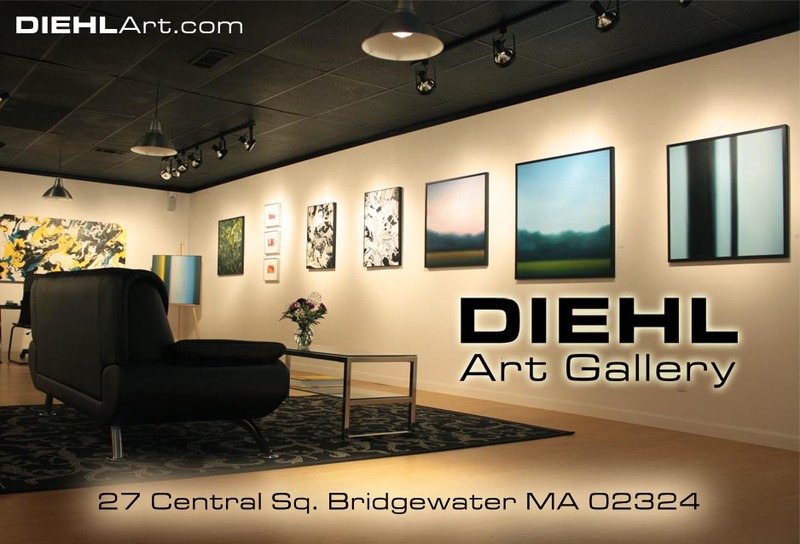 Diehl Art Gallery specializes in contemporary art, original paintings and is owned and operated by Bridgewater resident and BSC graduate John Diehl. Located in the center of town John Diehl's original paintings are available for purchase and enjoyment for the viewing public Thursday - Saturday 1-5pm as well as Friday nights 7-10pm. To stay up to date on the newest art and exhibits join the Diehl Art Gallery Facebook page! Also be sure to visit the Diehl Art Gallery website and Diehl Art Gallery blog. Check out these great photos taken in Bridgewater over the 4th of July weekend. Bridgewater native Nicole Bedard has launched her own photography business and these photos highlight her talent quite well. Enjoy! - Each participant receives a t-shirt and a sport ball. * No pressure in either program - just lots of fun while these young athletes participate in all three sports through unique games. * Participant-to-coach ratio is approximately 8:1, but varies by age group. * Children should wear sunscreen, comfortable sports clothes, shin guards, and sneakers. * Bring a snack and a plastic water bottle. Effective Monday, July 12, 2010, the Bridgewater Cole-Yeaton Senior Center located at 10 Wally Krueger Way will be open Monday through Thursday from 9:00 AM until 3:30 PM and Fridays from 9:00 AM until 12:30 PM. Congregate lunches will continue to be served on Mondays and Tuesdays. For further information and program schedule please call (508) 697-0929. The Bridgewater Public Library will sponsor a free, non-competitive Summer Reading Program for children from July 13 through August 12. This year's theme is: Go Green at Your Library. Children in pre-school through age 12 are invited to register. Participants are encouraged to read books of their own choice at their own rate. Pre-readers may have parents, caregivers or siblings read to them. Sign-ups begin on July 13 in the children's room. All reading participants are eligible to win a bike donated by the Estabrook & Chamberlain Insurance Agency of Bridgewater, sponsor of the reading program. Closing ceremonies for participants will be held on August 12. The Summer Reading Program is sponsored by Estabrook & Chamberlain Insurance Agency in cooperation with the Bridgewater Public Library, the Massachusetts Regional Library System, the Boston Bruins and the Massachusetts Board of Library Commissioners.